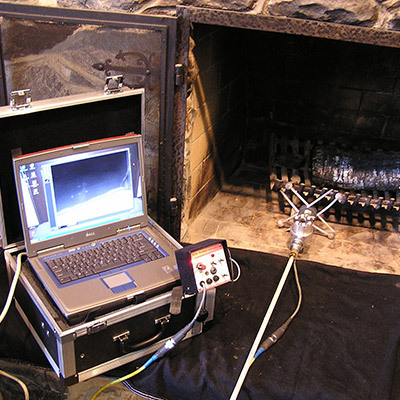 Chimney inspections ensure that your fireplace is safe. Get a quote now for your next chimney inspection. The point of a chimney inspection is to make sure your fireplace is safe to use. You don’t want any obstructions in your chimney that can cause problems. While it seems simple enough to perform by looking up your fireplace, there’s more to a chimney inspection than that. Areas like chimney flues, smoke shelves and dampers are difficult to see, so it’s important to hire a chimney inspection company such as Early Times Home Solutions. Our nationally certified technicians will make sure it’s safe to use your fireplace and your chimney is free of any fire hazards or damages. You’re probably wondering what’s included in a chimney inspection or what needs to be examined? Early Times will send a certified technician to visually inspect the entire fireplace system. Starting with the firebox, damper area, smoke chamber/smoke shelf and flue lining, the technician will also inspect the outside portion of the chimney structure including the crown brickwork and flashing. Inspecting a chimney isn’t something that can be done in a few minutes with an eye test. There are several components you need to look into to guarantee its safety. In fact, according to the Chimney Safety Institute of America (CSIA), there are different levels of chimney inspection depending on the situation, severity of the problem and how often your chimney is used. A level 1 inspection is the most standard inspection and does not include any major evaluation. After chimney fire, lightning strike, or other sudden damage. A level 2 inspection involves running a specially designed camera through the chimney, allowing the technician and homeowner to view live images of the chimney. The technician will point out problems such as missing mortar, chipped tiles, cracks, and more. Our technician will, if required, propose a course of action best suited for your particular situation. A level 2 inspection also involves everything included in a Level 1 Inspection. A Level 3 Chimney Inspection is the most in depth of all of the different inspection types. This type also includes inspecting concealed areas of the unit limited to areas only absolutely necessary to evaluate suspected hazards. A Level 3 Inspection also involves everything included in a Level 1 and 2 Inspection. Why Is a Chimney Inspection Important? It should go without saying that chimney inspections are important. If you’re still wondering why they’re important, it’s because they have the ability to prevent major problems from occurring in your fireplace and chimney, keeping your family safe. Whether you’re wondering if you need a chimney cleaning or you fear the worst, you should get a chimney inspection once per year. This is enough time between inspections without it being overwhelming but you’ll still be able to catch any major problems before they get worse. Chimney problems can be caused by any number of things. The most common problem is the build up of soot and creosote along your chimney liner – both are extremely flammable. To avoid chimney fires, you’ll need to sweep your chimney after burning a face cord of wood or after burning 50 fires. Soot and creosote build up is caused by simply using your fireplace. If you have a wood burning fireplace, the build up happens quicker. A chimney inspection can find both of these problems and many more. The goal is to catch them early so they don’t get any worse. That’s why you need a chimney inspection at least once per year. You can’t inspect your chimney on your own: you don’t know what you’re looking for or have the proper tools. How do you know what’s bad or dangerous? That’s why chimney inspection is best left to the professionals. They’ll find exactly what’s wrong with your chimney and offer the best solution for your problem. Plus, there are parts of your chimney that aren’t easily accessible. Our certified technicians know how to check even the most delicate areas of your chimney without causing any lasting problems in your home. Early Times has been helping homeowners with their chimney inspections for over 30 years. Our goal is to ensure the safety of you and your home. With that mentality, it’s no wonder our chimney inspections are top of line. We’ve even been recognized by Chimney Safety Institute of America.